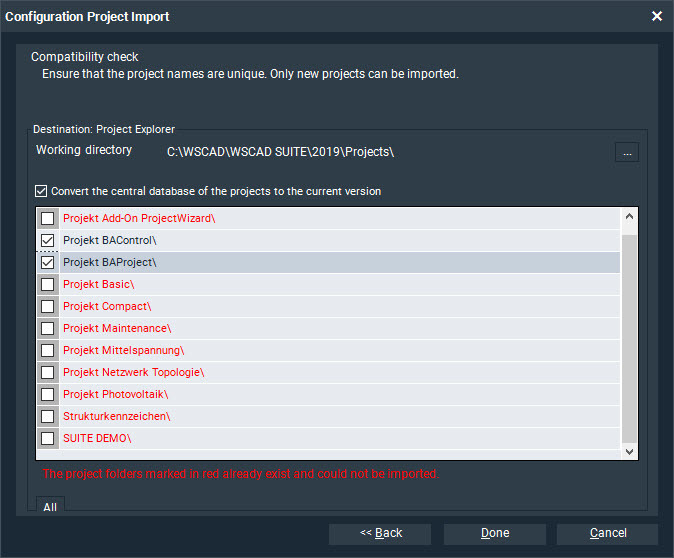 You can import projects, part databases, WSCAD components and configuration settings of a previous WSCAD SUITE 201x version into WSCAD SUITE X in one step. You can, of course, also continue to import projects, part databases, WSCAD components and configuration settings individually. Important: Part databases of previous WSCAD SUITE 201x versions must be imported into the current WSCAD SUITE. Only in that case will the data be adapted to the current database structure. The import of projects and data from a WSCAD 5.x version is no longer supported with the WSCAD SUITE X. A more detailed description of the project and data import can be found in the section “Import” in the online help or in the PDF file “<WSCAD installation directory> /Docs/WSCAD_SUITE_X_Project-_and_Data_Import.pdf”. All libraries from the Symbol Explorer. Stored in the Libraries directory. All templates from the Templates Explorer. Stored in the Templates directory. All macros from the Macro Explorer. Stored in the Macros directory. g., lexicon, addresses, manufacturers, … – but no part databases. Stored in the Databases directory. Predefined sets of frames and forms for the lists and plans. Stored in the Patterns directory. Company logos for frames. Stored in the Logos directory. Data sheets for the parts. Stored in the Externals directory. 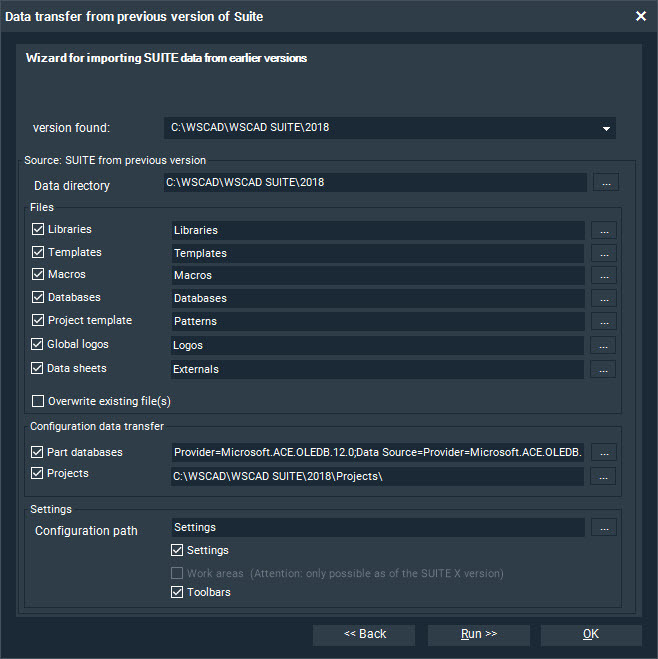 Settings: user-specific and program-specific settings that were changed under Tools | Settings (options) (e.g., for directories, colors, reports, texts,…). Work areas: position of the predefined, changed and newly created work areas. It is not possible to import work areas from previous WSCAD versions because the code for the program interface was changed for WSCAD SUITE X.
Toolbars: position of predefined, changed and newly created toolbars. Install WSCAD SUITE X parallel to the previous WSCAD SUITE 201x version, e.g., in the directory C:\WSCAD\WSCAD SUITE\2019. Note: Make sure that you do not install the new version in the existing installation directory of the previous version, since important projects and data will be overwritten as a result. If necessary, export the configuration settings of the previous WSCAD SUITE 201x version. 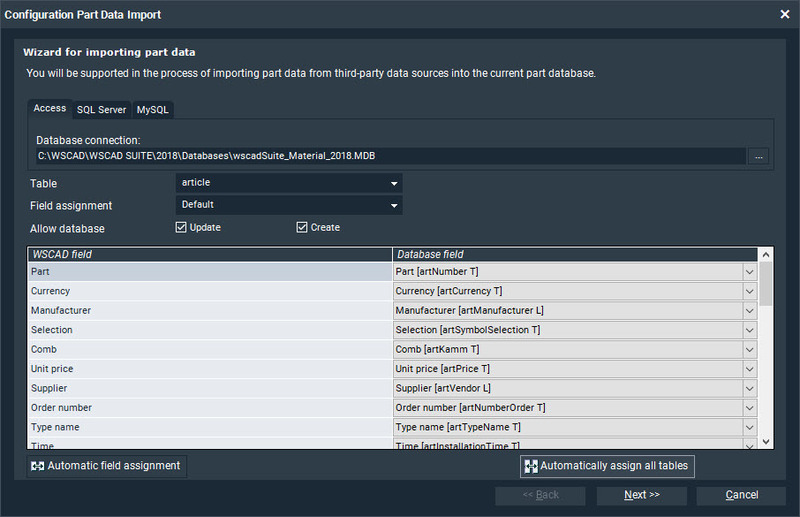 Import the projects, part databases, WSCAD components and configuration settings of the previous version in one step via the main menu item Tools | Data Import | Suite from previous version. Close and restart the WSCAD SUITE X if required. If needed, match the symbols and color codes via Tools | Master Data | Symbol Manager and Tools | Master Data | Color codes … | Import, respectively. Prerequisite: all projects are closed. Click in the menu on Tools | Data Import | Suite from previous version. The Data Import wizard opens. Select the check box Save settings (recommended).Depending on the settings in the next step of this wizard, configuration settings (toolbars and work areas) will also be overwritten. Consequently, a backup of the configuration settings should be created without fail. The backup is stored in the WSCAD installation directory under Settings/<username>/settings_*.wsCFA. It can be restored again at a later point in time with the menu command Tools | Import/export settings | Import. Click Next. You are taken to the settings for the data import. Select the installation path of the previous version via the version found drop-down list. The Data directory field will be updated. Navigate from the Data directory field via the Browse symbol button to the installation path of the previous version (e.g., to a separate network drive). In the Files pane, select the check boxes of the WSCAD components to be taken over. The Browse symbol button allows you to change the directories if the WSCAD components are not in the default directories. Select the Overwrite existing file(s) check box only if you want the current WSCAD SUITE X files to be overwritten with the files from the previous version. If you do not want to import any part database, proceed to step 16. To import your part database, select the Part databases check box in the Configuration data transfer area and click the associated Browse symbol button. Select the type of part database to be imported via the Access, SQL Server or MySQL tabs. Using the Browse symbol button next to the Database connection field, navigate to the part database whose parts are to be imported. If your part database contains multiple tables, you can set the mappings between the database fields and the WSCAD fields for each table individually. In general, you do not need to change the field assignments. Just click the Automatically assign all tables button. Click Next. If necessary, you can change the field assignments for each individual table here. Note: Please change the field assignments here only if you really know what you are doing. Click Next. If required, you can exclude parts from the import by using filters. Click Next. Here you can specify whether you want to use self-created database fields (user fields). Click on Done to exit the settings for importing the part database. You return to the data import dialog. If you do not want to import projects, proceed with step 24. To import your projects, select the Projects check box in the Configuration data transfer area and click the associated Browse symbol button. Select the directory with the projects to be imported (e.g., C:\WSCAD\WSCAD SUITE\2018\Projects). If the check box Take projects of the project management file in the directory is activated, only those projects that are present in the Project Explorer of the previous version are offered for import. If the check box is cleared, all projects are imported from the directory. Activate the projects that you want to import. If you want to copy the projects to a different project directory, select it using the Browse button behind the Working directory field. If the check box Convert the central database of the projects to the current version is activated This can take some time, depending on the number of projects and the size of the project. If the check box is not selected, the projects are converted once when in the WSCAD SUITE X is first opened. Click on Done to end the project import settings. You return to the data import dialog. If you want to apply the configuration settings from the previous version, activate the check boxes of the settings in the Settings area. If the configuration settings are not stored under Settings in the default program directory of the previous version, navigate in the Configuration path field to the storage location using the Browse symbol button. Click Run. The progress of the data import will be displayed. Note: count shows the number of data items in the previous version; copy shows the number of copied files. If the Overwrite existing file(s) check box was selected, the values of count and copy should be the same. Note: If the central databases are to be created when importing projects, the data import can take some time. Finally, click Done. The project and data import is completed. Depending on the selection of the components, a restart of the WSCAD SUITE X may be required. I hope this blog post has helped you. 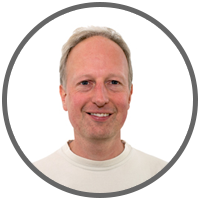 If you have any questions regarding project and data import, our support team will be happy to help you.